At a recent farewell banquet hosted by Iraqi government officials for General David Petraeus, an aide to Prime Minister Nouri al-Maliki lauded the U.S. military chief's efforts to help bring violence down to levels not seen since early 2004. "We appreciate what you've done, General," the aide recalls saying, "but there's another American General who would be warmly and immediately embraced by all Iraqis, one who would help us even more." "Who is it?" General Petraeus reportedly asked. "Tell me so I can send him." "General Electric," the al-Maliki aide replied. The line drew a lot of laughs, but in many ways it also highlighted how much this war-scarred country has changed over the 19 months that Petraeus has been at the helm of the Multi-National Forces in Iraq. These days, alarm over sectarian bloodletting spiraling out of control has given way to heated politicking, nascent reconstruction efforts and grumblings over the lack of basic services like clean water and reliable electricity. Still, the spike in violence over the past few days  some 70 people have been killed since Saturday  highlights why Petraeus has repeatedly said it's too early for "victory laps in the end zone." On Tuesday Petraeus, who oversaw the "surge" of 30,000 U.S. troops that helped quell the violence, handed control of U.S. forces in Iraq to his former deputy, General Ray Odierno, who had been among those proposing the contentious strategy back in late 2006. 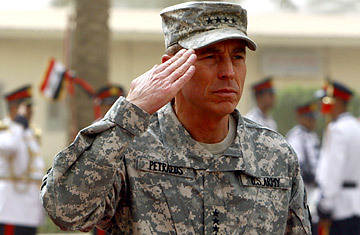 Defense Secretary Robert Gates, who presided over the ceremony in a former Saddam Hussein palace at a military base near Baghdad Airport, lauded Petraeus as "one of our nation's great battle captains." Petraeus, 55, will take over as head of U.S Central Command next month, which will give him responsibility for the U.S. missions in both Iraq and Afghanistan. "Darkness had descended on this land," Gates said. "Merchants of chaos were gaining strength. Death was commonplace. Slowly but inexorably, the tide began to turn. Our enemies took a fearsome beating they will not soon forget."